At BeA Alfresco Wedding we have several ideas for you to use on your wedding shoes which will amuse your guests when you kneel down in church – we know it’s a serious occasion, but it’s fun to do something to give everyone a small and unexpected giggle! Just don’t do what a friend of mine did and leave the price tag on your new wedding shoes – that did make everyone laugh, but he didn’t know why we were all giggling until later! Of course, you should make sure when using a permanent ink marker that the ‘inscription’ is totally dry before either the bride or groom steps into their shoes and walks down the aisle on a white or light colored carpet. 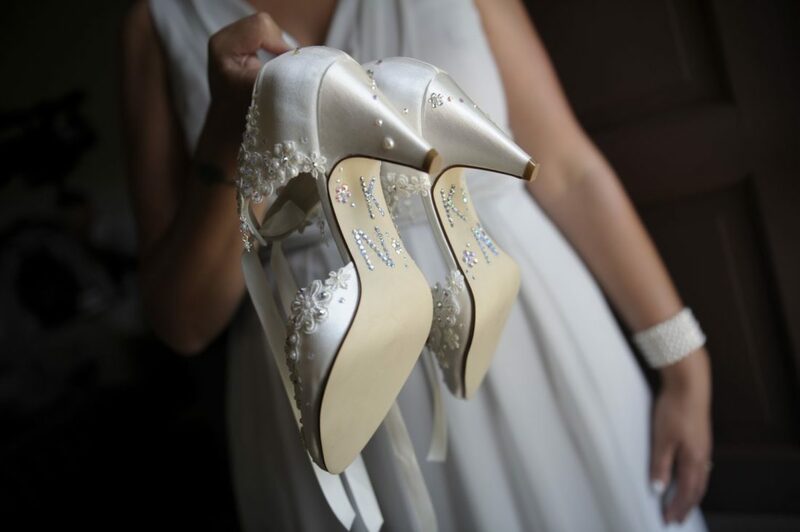 Either the bride or groom can write a romantic note on the soles of their wedding shoes; something that both of them can relate to – the date they met or their wedding date. The bridegroom can also have humorous wedding shoe decals or writing on his wedding shoes (be sure to remember to remove the price tag). He can have “He” on his left foot and “lp” on his right; or “Help” on his left and “Me” on the right. We think the choice for the groom’s shoes is even larger than that for the bride’s, as the groomsmen and bridesmaids can come up with their own sayings – and I’m sure they will have plenty of ideas for him! You can purchase ready-made decals online from several sites; you can order the couple’s initials set with crystals to decorate the heels of the bride’s shoes, and also stick-on messages for the groom’s shoes. This is a fun idea, and has been adopted by many of the couples who chose BeA Alfresco Wedding for their wedding in Italy – and is only limited by the imagination of the bride and groom, or the wedding party. We hope you like our suggestion for an amusing little ‘extra’ for your wedding!